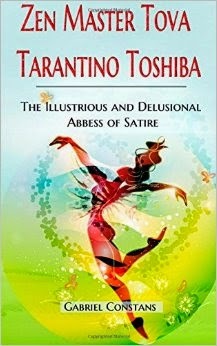 Gabriel Constans, Zen Master Tova Tarantino Toshiba: The Illustrious and Delusional Abbess of Satire. Fountain Blue Publishing, 2014. Pp. 114. ISBN 978-1-62868-045-4. $6.99. In the 1970s, I treasured the small paperback book of Japanese crazy wisdom Zen Flesh, Zen Bones, compiled and translated by Paul Reps and D. T. Suzuki; in addition, the Sufi paperback, translated by Idries Shah, The Exploits of the Incomparable Mulla Nasruddin. Both collections had wisdom stories that often confused and perplexed, but if you thought about them enough, they would make a kind of sense. Well, usually. Zen Master Tova Tarantino Tobshiba is a contemporary companion to, or descendant of, the two collections mentioned above. Like them, the book has mostly quite brief narratives or sometimes koan-like sayings. However, they also seem to have a contemporary American spin on them, and at times the “point” is so obscure—at least, to this reader—that one must assume that either 1) it is working its way against the logical mental grain within, or 2) one just doesn’t get it. Sometimes, I think that the point is that there is no point. This is a book of wisdom tales and sayings that denies that they have anything to do with wisdom. One of the blurbs on the back cover says, “‘There are no teachings that are outside of you, except the ones inside this book. Unless, of course, you’ve eaten this book.’ —Bob Tzu, guru, avatar, wisdumb teacher at duhism.com” In part, this blurb, and the others as well, goes against the proverb, “Never tell a book by its cover,” and the whole question of what is without and what is within is brought to special prominence here. The titular Zen Abbess has a name that by itself could win a commendation for diversity: “Tova[h]” is Hebrew for “God is good,” “Tarantino” is Italian for “maker of low-budget hilarious violent movies,” and “Toshiba” is Japanese for “maker of laptops.” The Abbess lives up to all those associations. There are occasional particular allusions to or metamorphoses of stories in Zen Flesh, Zen Bones. In that collection is the tale of a young swordsman who seeks the greatest swordsman of the era, who is living as a hermit in the mountains; when the young man finds him, he asks to be taught the art of swordsmanship. The hermit agrees, then sets him to doing chores around the house. After several days, the young man complains that the lessons hadn’t started yet, so the master says that he will start them. The young man now, at moments he would least expect it, the old man whacks him so he’s in pain and in shock. The young man ultimately somehow develops a sense that will tell him to expect a blow, and to dodge it, but he still grumbles that he can’t be able to seriously wound someone else on a stick. Finally, he gets his chance: the master is hunkered down on the floor over the fire, stirring the pot, so the student swiftly strikes him with a stick. Before he can connect, however, the stick is blocked by the pot’s lid, held up like a shield. At this point, the student realizes that the swordsman has taught him the most valuable lesson of swordsmanship: to be totally there so as never to be ambushed. There is a story in Zen Master Tova that is very much like this: a man who has come a great distance to receive the Master’s wisdom arrives and the Abbess sets him to cleaning the toilet, then to doing the laundry, and so on. Assuming these are acts he must carry out as part of his training, the man does them, but finally he explains that he has come thousands of miles to receive her instruction. She says that they asked for help with doing the various menial tasks around the monastery, and he is exactly what they asked for. He can stay. She leaves the room. Even though the Suzuki-Reps and the Shah above both presented their “message” in a package that seemingly reflected the paradoxical nature of their crazy wisdom, ordinary people in their twenties could tell what was going on, and move their own minds further into the area of Nonsense by reading and meditating upon these texts; Zen Master Tova has created a new method of entraining students’ concerns, using some similar story-telling techniques, leading to places where one wonders what the point is. This is completely consonant with the Zen or Crazy Wisdom perspective that there is no point. If you see the point along the road, kill it! Another aphorism about the Practice of Mindfulness: “It takes practice not to practice.” Once having read this, one thinks it through, and one thinks it over. Suddenly, one realizes that s/he has been standing on a permanent loop. There are so many ways of losing touch! Zen Master Tova is a book to remember, but particularly, it is a book to forget. It is deceptively simple, or it could be called simply deceptive. It is a book to wrestle with, but that doesn’t mean one wrestles with an angel.